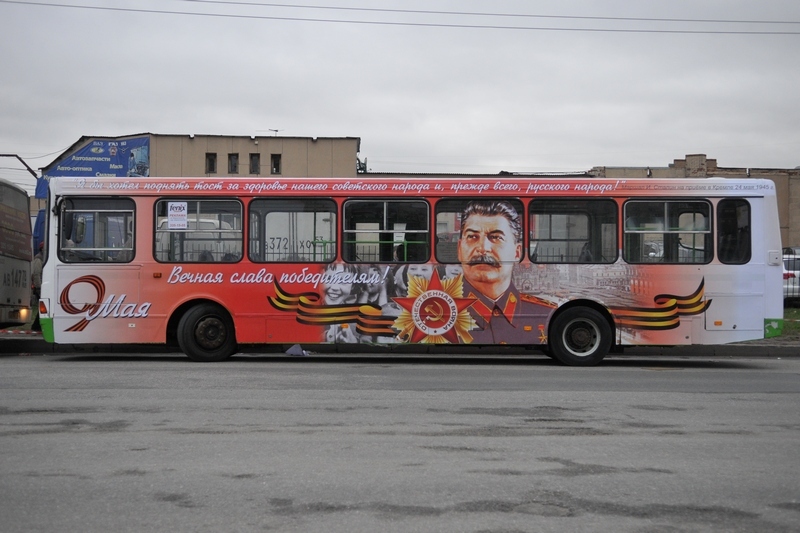 A bus that began operating in Russia this month to celebrate the wonderful Russian hero known as Stalin, greatest mass killer of Russians in world history. A quote from Stalin below his image reads: "“I would like to drink a toast to the health of the whole Soviet people, and, first and foremost, the Russian people!" Presumably, his goblet would be filled with their blood. We can only ask ourselves: What kind of barbarous, self-loathing nation is this, anyway? This man was the greatest mass-murderer of Russians in world history! How dare they?! It’s like Israel putting Hitler on a bus! 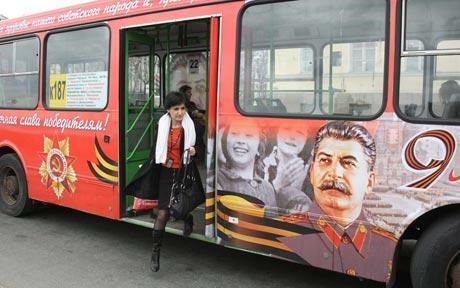 Check out that reverse view image of Stalin in the window in the background. Yikes! What a country! If there was an award for despicable legacies Joseph Stalin would rank right up there with Hitler and Mao for the men with the most blood on their hands. By conservative estimates the man who led the Soviet Union for 30 years until his death in 1953, was responsible for killing some 20 million people, most of them his own citizens. His penalty? In May of this year when Russia celebrates it’s victory over Germany in World War 2 (victory with the help of all it’s allies including America) it will put Stalins face on billboards all over Moscow. Of course not erasing him from history and putting his face on billboards is quite another matter to Russians we talked to in the street. One woman said “so many people suffered fromk this man, generations of people who are still alive, families, good smart people simply vanished because of Stalin”. If the human rights activists were more laid back, they would be able to rebuff any of their opponents’ claims not with demonstrations, but with a dull lecture for the semi-literate about the difference between a poster, a history textbook and academic research. So, dear conservatives. There are some differences in genre. Scientific labor presupposes a kind of indifference on behalf of the scientist toward the final outcome of his study. Accepting the Solzhenitsyn Award, the great linguist Andrey Zaliznyak acknowledged the praise that he was given and stated the following: I did not try to confirm the authenticity of “The Lay of Igor’s Warfare” [an epic poem of old Russian literature], I just studied the issue. It just so happened that the authenticity was confirmed in the end. But if the poem turned out to be phony, it would have been a scientific finding all the same. Last week in Russia, billboards were going up and they were coming down. In Omsk, a billboard advertising a children’s theater piece which declared “We await you, merry gnome!” was hastily ripped down in anticipation of Russian “president” Dima Medvedev’s visit, lest the diminutive little president take offense. If that sort of behavior reminds you of the insanity that went on during the time of Josef Stalin, you’re not alone. 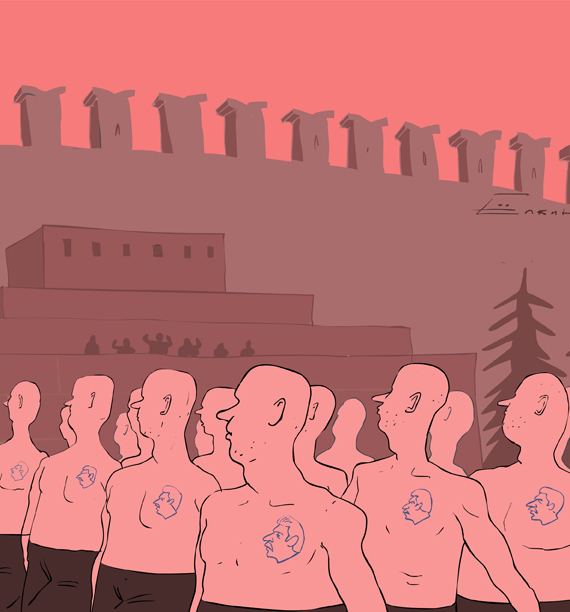 Some idiotic Russophile commentators would like to paint Dima as some sort of “liberal,” but it’s perfectly clear his own countrymen don’t see him that way. If they did, the merry gnome would still be merry. A lot of evidence is emerging that Stalin was the first democrat of our country. How can a textbook prove that Stalin was a tyrant? I’ve come here to defend Stalin, to defend him against these terrible accusations. He was a great man. He united the country and created a great superpower. Those were the words of the Russian supporters of the greatest mass-murderer of Russians in world history, Josef Stalin, gathered outside the Basmanny District Court last week, defending their hero as his legal case for libel against the heroic Novaya Gazeta newspaper went straight into the crapper. 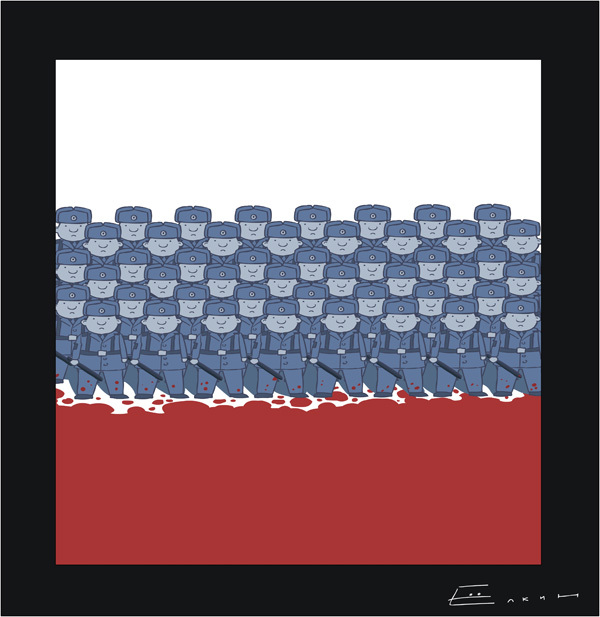 It used to be somewhat challenging to expose the fraud that is Vladimir Putin. The smokescreen around him, created by the accident of soaring world crude prices, combined with his malignant ability to lie without shame or remorse, were somewhat formidable obstacles. But now, it’s like shooting fishkies in a barrel. Putin is getting desperate, and he’s getting very sloppy.